HENLEY-ON-THAMES TOWN COUNCIL WELCOMES ALL VISITORS TO ENJOY OUR BEAUTIFUL RIVERSIDE TOWN BUT PLEASE BE AWARE THAT AS FROM 2019 NO BBQ'S WILL BE PERMITTED ON EITHER MILL OR MARSH MEADOWS. A recreational area located next to The Fairmile that includes a children's playground. This Recreation ground is located on Greys Road just above the Scout Hut. It includes a childrens play area and skateboard area. 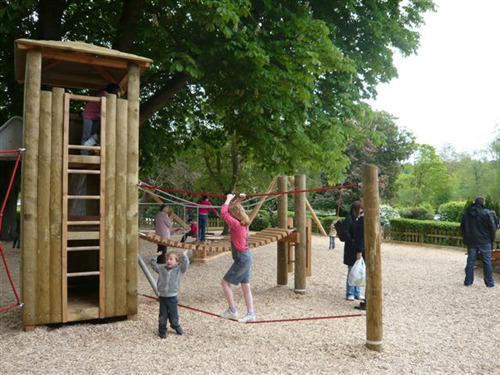 A large riverside recreational area that includes a fantastic new toddler play area as well as an older childrens' playground and acres of open space and a wildlife walk, and the riverside towpath to March Lock. There are recently refurbished public toilets here too. For a link to the Henley Wildlife Group's website to view their activites please click here. Click here for a map of the Mill Meadows and Marsh Meadows area. The map gives details of the picnic areas, wildlife trail, parking and facilities. The bandstand at Mill Meadows is available for hire (free of charge) for muscial concerts on Saturdays or Sundays throughout the summer. Click here for further information about Music by the River. Henley Bowls Club is based at the Leichlingen Pavilion in Mill Meadows and welcomes visitors and new members. All are welcome to their Monday evening summer coaching sessions and social activities in the winter. For further information on the Bowls Club please click here. Mill Meadows Management Plan - for a copy of the management plan please click here.